This is a picture of son pvt Thomas M. Yenichek. He graduated 1-29-10 from India company 3rd Battalion platoon 3012 Parris Island North Carolina. He is headed for the School of Infantry next where he will train to be 0311. 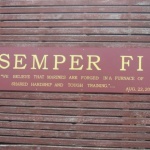 My son graduated from Parris Island January 22, 2010. I am so very proud of my son. 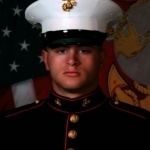 Here are some pictures of My Marine…PFC Childress, Christopher, B. 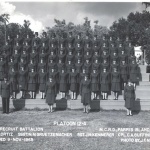 His grandmother and Great grandmother are also in one of the picutres. I will always be a faithful and Proud Marine Mom. Well, it has been many years since I became a Marine. I just thought that one of my four children would become a Marine, but only one has joined the service—the Air Force. Upon graduating as a Honor Graduate, another airman asked him how he did it. His answer floored me, but made me proud too. He said, “Do you think I could be anything but number one being raised by a Woman Marine”. He went on to graduate from Tech school as an Honor Graduate too. Thanks for all the stories, etc. I found your website when I was looking for Christmas gifts last November for my son. He has wanted to be a Marine since he was twelve years old. In November 2008 he signed up and was in the Poolee program the rest of his Senior year. Although he wasn’t a Marine yet, we purchased a few items from your site and tried to become enthusiastic about his decision (which I’m very proud to say we are very happy for his decision). 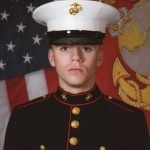 It is a very scary thing for a Mom to let her son grow up and go out on his own but when you add joining the Marine Corps to the mix it adds a new dimension to the feeling. Nonetheless, I have since enjoyed your newsletter, loved the items you sell and found great comfort from the stories I read in the newsletter. I have since discovered what Honor, Courage and Commitment truly means and now understand the pride felt by all Marines, new and old. I have learned to embrace my son’s decision and to be very proud of his decision. I wear a badge with my son’s picture and tell everyone I meet about how proud I am to be a Mother of a US Marine. Love reading the various stories you share with us. 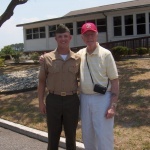 I came across this picture that was taken 4 years ago at my sons graduation from Parris Island. It was and will always be one of the most memorial events in our lives. Not only because of what my son accomplished but the fact that my father (Cpl Kenneth Oltman) could be there for that impressive day. We weren't sure that my mother and father would be able to attend because he hadn't been well but all the plans worked out for them to come. While standing in the bleachers listening to the men and women singing the Marine Corp Hymn I looked over at my father who had tears in his eyes singing along. He was so proud of his grandson, you could just see him beaming. 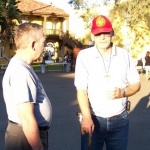 My father since passed two years ago from cancer but when ever I hear :"From the Halls of Montezuma, to the Shores of Tripoli…" I remember that day and how proud my father was of being a Marine. It brings tears to my eyes and makes me beam with pride. He was and will always be our inspiration. 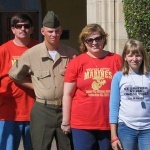 Our son, Aaron, graduated from MCRD San Diego 30 January 2009. Things were such a whirlwind that I never got to take a photo of all the Marines in our family standing together that day. Our friends from Washington, Rick (Vietnam era Marine) and Donna joined us. Rick and Aaron have a special relationship. Also my husband's mother and stepfather, Harry, drove in from Arizona. Grampa Harry served in the Marines in the 50's. And my husband served in the late 70's/early 80's. Four Marines proudly representing the Corps and our family that day.